so your well thought out conclusion to that poll is that Americans do not have much love for millionaires? Or maybe your conclusion should be that most people are fine raising other people's taxes and not their own. 76% of those polled liked Trumps speech. 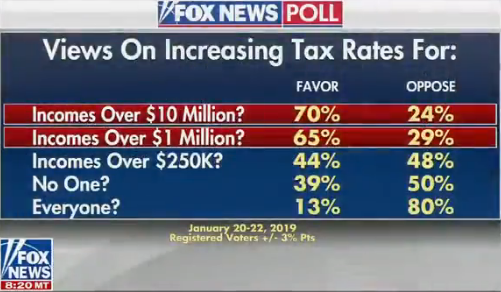 So now more people are in favor of his ideas that the percentage that want to tax billionaires?? I thought you didn't trust Fox News. I think the results of that poll would be properly read by claiming that people want to tax anybody but themselves --- you know, tax the smoker, tax the drinker, tax anybody but me leftist attitude. We've landed on the moon!!!! Here's a hint for you: there will always be envy in the world, & there always has been. Elections are even won on the promotion of envy, believe it or not. but why shouldn't we all participate in securing our safety? This is the equivalent of spending 10 cents to protect $100 (GDP). If it works then we protected our wealth, if it doesn't work then we still have $99.90, and a wall. And why shouldn't we all participate in the income gains that have occurred over the past several decades? Had everyone had an increase in income as was previously the case and not only the highest few percent, then people might be more willing to participate. Concentrating the economic gains but collectivizing the economic costs is not sustainable. This is not an "envy" thing as people patronizingly try to make it out to be. I'm in the 95th percentile, I am personally fine. But, I have concerns for the condition of our nation if this continues and concerns for the methods that government will finally choose when it becomes so painfully obvious that it needs to be looked at. Calling this data just envy is far too simplistic. Envy is certainly not the only element, but it's without question part of it. Did you look at the chart? How exactly did envy create that clear change in data? As you said, there will always be envy, so it is irrelevant to the discussion as it is just baseline noise. There has been a fundamental change in the way that income gains are distributed in the country and I do not think envy snuck in to the country in 1980 to cause it. How is envy not relevant to the topic of this thread? The thread is about people's attitudes regarding increasing taxes on high earners, not your subthread about stagnant wage growth. Further, if you think that envy is not a useful tool that gets used plenty in politics, I just disagree with you there. In my opinion, legal and illegal immigration has stunted the growth in wages for low paying jobs. It's not hard to see. The vast majority of low paying jobs are performed by immigrants whether they come from Latin America, former Soviet Republics, middle east, near east, far east, or Africa. We need to rid ourselves of the illegals so that legal immigrants can prosper. I'm interested in this chart. Any thoughts on what underlies the data? I am interested in people's rational thoughts. A lot of times information is presented and there isn't any analysis. I'll throw out a few ideas: 1) it is based on family income. My guess is that since the 1950's - 1960's you have a LOT more 1 person families. People are getting married later or never. They may have roommates or live-in's but when a poll taker or on income tax or whatever the means of collecting data is, they are a family of one. 2) Then you add single parenthood which has risen dramatically since that time. 3) Public assistance, maybe? A lot of that is non-cash in the form of subsidies for rent, food stamps, daycare. That would show a decrease in (cash) income. 4) Less interest in education on the lower end of the spectrum. I think kids used to get better educations that prepared them for a job--even in low income or segregated settings. 5) Incarceration rates. 6) very few unskilled jobs where you can start out at the bottom and work your way to a decent living. I am guessing that there are some other structural things going on too that push family incomes up on the higher end of the spectrum. More people attending college, more dual income couples. that would push things up on the higher end of the scale. Possibly computers and internet. It is possible to work remotely which opens up opportunities from all over the world, or start a side business. Or even start a side business and become an entrepreneur earning much more than you would working for someone else. we really need to know why there is a divergence before we can proclaim it bad / evil. I'm no economist, but it's fairly obvious that someone with more money has an ability to turn that into even more money through investments that a simply poorer person cannot. They're also, of course, incurring some risk in doing so. 1) Envy and greed play as huge part of some people’s desire to tax others. 2) Some people are fine with negative items that don’t effect them. And they become supportive of ideas that could be positive for them even though it is negative to others. 3) Some people believe Obama’s falsehood that people didn’t build businesses but government did. 4) Some people have zero idea what the true cost of free college, free healthcare, and free income are. Nor do they care because they don’t provide a measurable amount of the revenue required to pay for the expense. To them it is some one else’s problem. How much more of our income is eaten up with what we now consider basic expenses than in 1980? I honestly don't know. My parents had a mortgage, utilities, maybe a credit card, & that was about it. My wife & I have a mortgage, utilities, student loans, car payments, health insurance, & about $400/month in cable, internet & cell phones. The cost of healthcare & the ridiculous increase in education have definitely cut into young graduates abilities to invest in a home (for instance) at an earlier age. Good points. I'm not sure how old you are but when I was just out of college, we couldn't afford to buy a house either. Interest rates were 8+%. Our electric bill was $200/month in the winter and you actually had to pay for long distance phone calls. To me, other than healthcare, it seems that things have gotten much cheaper over the long haul. If equal numbers of billionaires and all economic classes were polled it would be interesting to see the results. Considering well less than 1% are billionaires the representation isn't statistically accurate, only numerically accurate. Maybe. 1. First off Income gains are not "distributed" in this country...they are earned. that is the main reason some folks don't sustain or increase these gains as much as others. 2. The tax cap was taken off the masses in the late 1980's and individualism took root. Those with skills and knowledge capitalized...those without didn't. 3. Companies who formerly hired in country began to outsource not only employees but production due to cost savings...this hurt low/middle wage earners as their very Unions made life for their companies unsustainable. It helped the company share holders and owners. 4. Globalization hurt the lower wage earners and helped the higher wage earners. Free markets hurt the manufactures who paid higher wages than their foreign competition. 5. Companies, now outscored all over the world, began reducing pension benefits in favor of stock market investment in self directed optional 401K. This change helped those who personally save and hurt those who don't. 6. Personal freedom is great for many and not so great for some...peoples choices have more consequences when we are free to make them on our own. 7. Voters rejected the nanny state in favor of grand possibilities...sometimes grand possibilities make for very poor financial decisions...sometimes people make the right ones. Basically you can't have the massive good without freedom...Rising tides do lift all boats...except the ones with, many times, self inflicted holes in them. You don't fix people without knowledge or ethical moral values by giving them all the freedom they want...you can only make it available to them for it to be abused or treated with care. Some of these issues are being worked on right now in the form of actual trade negotiations for the first time in many years...maybe we can make some headway.